Come in… You are home. The Patio main space for life inside the Riad, with very large proportions beautifully maintened vegetation and nice fountain creating an ideal place for your dinner, a lovely evening under the moon light, or friendly discussions over mint tea. Our Lounges are perfect for your lovely dinners or with your family. Romantic atmosphere due to soft fountain sounds, whistling birds in olive trees and orange tree perfume. Solarium and Terracce are perfect places to relax and to sunbathe in the nice relaxing chairs. It’s very nice to take a little shower when it is very hot outside. Riad Soumia’s s terrace is above the Medina and offers you a stunning panoramic view. With clear weather, we can see Atlas Mountains… sometimes with snow ! Marrakech Suite is a 26m2 very large Suite with private loggia (with independent stair access). Amenities include 160cm double bed, private bathroom, separate shower and WC completed with lounge and fireplace. Essaouira Suite is a 22m2 very large suite with 180cm double bed or twin. Amenities include private bathroom with circular shower and WC completed with a lounge. Central heating and air conditionning. The Zagora bedroom is a 20m2 very large room with double bed 160 cm or twin, private bathroom, separate shower and WC completed with lounge. The Cannelle Room is a large 18 m2 bedroom. Amenities include 140cm double bed, private bathroom with shower, WC and air conditioning. Atlas Terrace Room is a large 14 m2bedroom. Amenities include 140cm double bed, private bathroom with shower, WC and air conditioning. Building next to the main building (Riad Soumia). 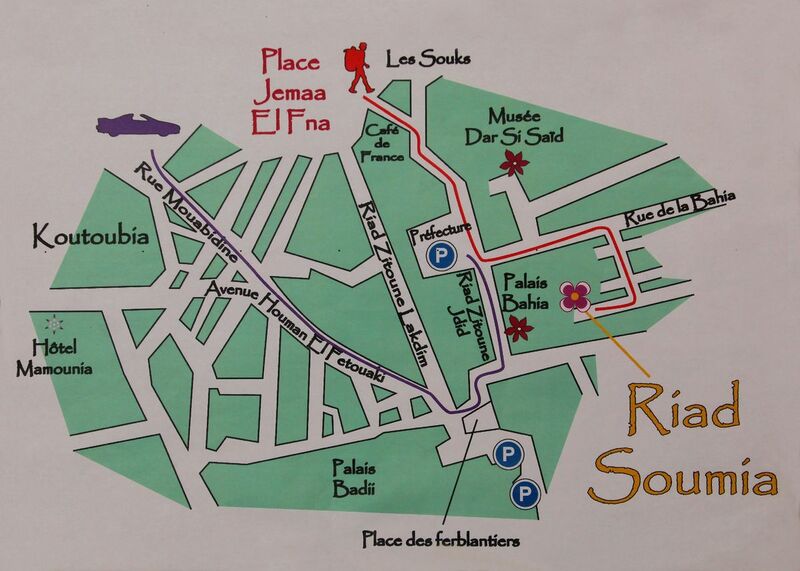 Do you want to spend a few days in Riad Soumia? Prices in Riad Soumia are «breakfast included». Except for specific whishes, we serve you a traditionnal moroccan breakfast (inluding yoghurt, cheese, etc). To help you when you arrive or when you leave from Riad Soumia, we offer you private transfer service (taxi from airport or train station). Dinner is available on request at the Riad, serving a traditionnal moroccan menu. We can help you to organize your trip projects. We propose you traditionnal moroccan treatments with black soap, scrubbing, wrapping rassoul (earth argile) and massages with Argan oil. Any questions? Do you need more information? We are here to answer.